In an earlier post, I mentioned being described as bold, brash, and brazen for having a tattoo of a cross and stars on my right forearm. My tattoo was meant to be a reminder to myself of all that I believe in and am called to be. It serves as an antidote for that nasty little gremlin voice in my head that is constantly reminding me what a screw-up I am and how God couldn’t possibly accept me “as is”. I remind myself often that Jesus was not a nice quiet Jewish boy. He was a radical in every sense of the world. He challenged the status quo. He asked the hard questions no one wanted to face. He proclaimed boldly that the Kingdom of God was at hand. He was not mainstream by any stretch of the imagination. He calls his disciples to boldness in their proclamation of the Good News. I didn’t set out to be bold. I sort of stumbled into boldness and landed in grace. Every time someone asks about my tattoo, I am given the opportunity to proclaim my faith. Disclaimer: I am not recommending that anyone go out and get a tattoo. Okay, now that I have that out of the way, let me tell you the “why” behind the tattoo and then I can explain the tattoo itself. 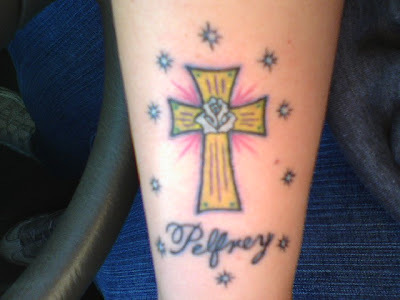 From the time I was seventeen, I wanted a tattoo. To me it was something so deeply personal and even spiritual. No, I don’t think skulls, demons, or Betty Boop are personal or spiritual. I am talking about a tattoo that I would design myself. I knew I wanted a white rose. To me a white rose signifies perfection. Just as white light is made up of all colors, a white rose can represent all the meanings that colored roses carry: love, affection,passion, friendship, loyalty, gentleness, grace, joy, harmony, calm and delight. My first sketches were all of long stemmed white roses. At nineteen, after having survived an abusive boyfriend and the months afterwards when he stalked me everywhere I went, the rose sketches now also featured thorns and drops of blood. At twenty, when I met my husband, I considered two roses intertwined. He wasn’t a big fan of tattoos and when we got engaged, he suggested I wait until after the wedding so I wasn’t trying to find a dress that would hide it. I wasn’t so sure I wanted to hide it but a wedding wasn’t exactly the proper place to be flaunting a new tattoo in front of both families, neither of whom were likely to be thrilled at the idea. After the wedding, there was never enough money and then there was the question of whether or not I could take the pain. After having my first child, who weighed in at eight pounds and eleven ounces, without an epidural or drugs, I knew pain was not going to be an issue, but now I was a mom. Moms don’t have tattoos. Or do they? I still sketched, always with the rose in there somewhere. After twelve years, as the marriage was falling apart, I sketched one of a stained glass window with the rose in the center and the word “Nevermore” at the bottom as a tribute to The Raven by Edgar Allen Poe. The character says his soul is trapped by the shadow of the raven. I was in despair and felt completely trapped in my own home. At thirty-four, I filed for divorce. Six weeks later, I had created the final sketch of my tattoo and made an appointment to have my tattoo done. I had to wait three weeks to get the artist that I wanted. I went to a Healing Mass with my friend Patti on the night before my appointment. She tried desperately to change my mind. She offered to give me back my deposit money. She offered to buy me a cross necklace, ring, bracelet, anything I wanted if I please, please, please wouldn’t do this. I was not about to be swayed. I had waited seventeen years and that was long enough. I wanted a mark of my faith. God had saved me from myself and had given me the strength to take myself and my children out of a bad situation. I wanted a reminder to myself of who I am and what I am called to be. I was not thinking that this would be such a powerful symbol to the people I encounter. That never even entered into the equation for me. For the first time in my life, I did something that I wanted and in my mind it benefited no one but me. Little did I know how many conversations about faith would stem from this particular white rose. It was ironic to me that it took three hours to have it done – the same amount of time that Jesus hung on the cross. I had to face my fear of needles and even though I hate the sight of blood, I watched her work. People always ask me if it hurt. In a word -YES! The pain was like a really bad cat scratch, except it didn’t stop for hours. The needle literally colored on my arm, one small section at a time for nearly three hours. Was it worth it? Again – YES! I have not regretted it for a moment. I do not try to hide it. I am not ashamed of it. I love when I run into someone who will ask me what it means as opposed to the usual “Where did you have it done?” or “Did it hurt?” or my least favorite, “Did you do it out of spite?” which I get because of the timing of it. So what does it mean? I am an avid reader and writer. I thrive on symbolism. So here is the symbolism behind the tattoo. Outside of Rome uniformity of observance was affected in the second quarter of the nineteenth century by the abrogation of other uses. In the Western Church only the Ambrosian Rite retains its peculiar colors. Most of the Oriental rites have no prescribed liturgical colors. The Greek Rite alone has a fixed usage but even among them it is not of strict obligation. The Ruthenians follow the Roman regulation since 1891. The variety of liturgical colors in the Church arose from the mystical meaning attached to them. Thus white, the symbol of light, typifies innocence and purity, joy and glory; red, the language of fire and blood, indicates burning charity and the martyr’s generous sacrifice; green, the hue of plants and trees, bespeaks the hope of life eternal; violet, the gloomy cast of the mortified, denotes affliction and melancholy; while black, the universal emblem of mourning, signifies the sorrow of death and the somberness of the tomb. The solemn blessings (beatitudines, benedictiones) which mark the opening of the Sermon on the Mount, the very first of Our Lord’s sermons in the Gospel of St. Matthew (5:3-10). Four of them occur again in a slightly different form in the Gospel of St. Luke (6:22), likewise at the beginning of a sermon, and running parallel to Matthew 5-7, if not another version of the same. And here they are illustrated by the opposition of the four curses (24-26). The fuller account and the more prominent place given the Beatitudes in St. Matthew are quite in accordance with the scope and the tendency of the First Gospel, in which the spiritual character of the Messianic kingdom — the paramount idea of the Beatitudes — is consistently put forward, in sharp contrast with Jewish prejudices. The very peculiar form in which Our Lord proposed His blessings make them, perhaps, the only example of His sayings that may be styled poetical — the parallelism of thought and expression, which is the most striking feature of Biblical poetry, being unmistakably clear. 1 – I am the Lord thy God and thou shalt not have any strange gods before me. 2 – Thou shalt not take the name of the Lord thy God in vain. 3 – Remember to keep holy the Lord’s Day. 4 – Honor thy Father and Mother. 5 – Thou shalt not kill. 6 – Thou shalt not commit adultery. 7 – Thou shalt not steal. 8 – Thou shalt not bear false witness against thy neighbor. 9 – Thou shalt not covet thy neighbor’s wife. 10 – Thou shalt not covet thy neighbor’s goods. 7) From thence He shall come to judge the living and the dead.